Get ready to feel all warm and fuzzy inside, because you're about to witness one pit bull who knows how to make a rather precious connection with some very unlikely companions. As Animal Planet reports, known as a breed who loves playing with friends, it shouldn't come as too big of a surprise that she doesn't discriminate when it comes to what her friends look like. As a matter of fact, its natural tendency and "eagerness and ability to assume the role of a child's nursemaid," also probably plays an important role in this pit bull's reaction towards the babies inside the coup. That's why when shay Israel lets her into the coup, as you can see in the YouTube video below, all of her curious attention goes right to the baby turkey that was born just 2 days prior. "Look how she's worried about the one hiding in the corner...so cute!﻿," Sandy Broker commented on YouTube. Even in spite of the friendly nature that, according to Animal Planet, turns pit bulls into "a fun-loving character that loves playing with its family and friends, (...) typically playful, companionable, amiable, docile and generally responsive to its owner's wishes," the patience, gentleness, and love this dog shows are surprisingly remarkable. Now, this would be adorable in its own right, but then all the chicks hop on the pitbull's back as if to say, "Hello friend. You might look really different, but you're just like one of us," it's almost impossible not to choose that as your favorite moment of this adorable of this interspecies show of affection. What did you think? 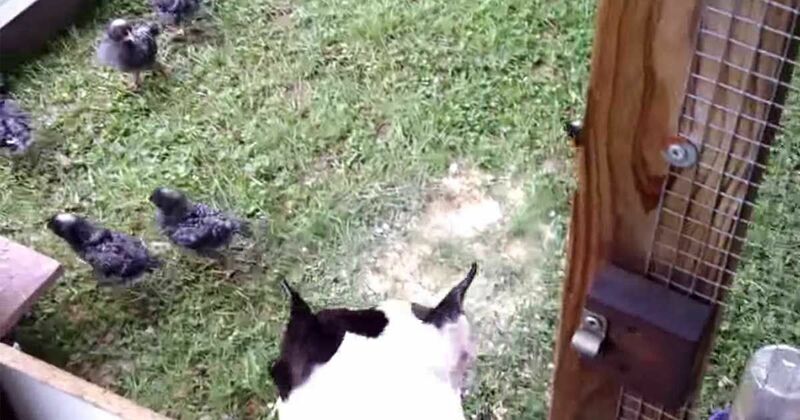 Have you ever seen a dog have this kind of relationship with baby chicks or turkeys? Let us know in the comments, and if it put a smile on your face, share this with your favorite animal-loving friend.